It’s a little disorienting to return to the universe of 24 without Kiefer Sutherland’s scowling super-Fed Jack Bauer saving the world. However, Sutherland has left the role behind. He’s now saving the world as President in Designated Survivor. What is CTU going to do? This reboot of 24 is different from the original series in several ways, so the fact that they have a new lead role is not all that shocking. In fact, Legacy has changed the most basic facet of the original series: each episode is supposed to be an hour of a single full day, filmed in real time, with commercial breaks taking place when the characters are doing unimportant things like feeding the cat, getting their coats, ordering food through drive-thru windows, or going to the bathroom. 24: Legacy continues the hourly episodes and the real-time gimmick – however they lose the 24-hour clock. This limited series only has 12 episodes, covering 12 hours, or half a day. (Perhaps it should be called 12: Legacy?) In fairness, the shortened season was also done with the last reboot in 2014, 24: Live Another Day, where Sutherland came back for one last fling with the character. It actually probably makes sense to limit the story a bit. In the original series (2001-2010) the stories tended to run out of steam as the season went on and they often had to reboot the situations about halfway through the year. Limiting the plot may not hurt. However, with all of these stories piling up, 24: Legacy has a bit of a problem. The lead character is just not nearly as interesting as Jack Bauer. Eric Carter (Corey Hawkins) is simply not as likable: he seems a bit holier-than-thou, he doesn’t trust or rely on anyone else, and he does not have that haunted, guilty look in his eyes that Sutherland often had, his skill sets do not have the built-in approval of the audience. This is not an indictment of Hawkins, who does as well as he could with what he was given, it’s just that I have not bought into this character like I did the last one. Little things that seemed like bravery in Jack Bauer’s CTU feel like hubris here, like for example the time when Carter refused to wait 20 minutes for a bomb squad, barking “That’s too long!” at CTU, and then he takes a good 15 or so minutes finding someone to walk him through and learning about bombs. Five more minutes and a professional could have come in and done the job without any of the unnecessary set up, learning on the job, and potential for error. But, no, Eric Carter believes only he can do things right – even though he makes a whole gaggle of mistakes over the course of the season. By the way, also, the season-long subplot of whether he would be losing his wife is also ridiculous, at no moment in this show does their marriage seem to be on the rocks. The show’s politics, which were always a bit cartoonishly right-wing, have become even more superficial this time around. Hot button points like racial profiling, PTSD, political corruption, the drug war, the morality of torture and others are thrown out with little thought or depth. However, the big selling point for 24 has always been its constant state of runaway-train action, and even if this new version clunks along sometimes, the story still keeps you riveted through most of the season. The action scenes are regular and impressive. 24: Legacy does definitely succeed as an action thrill ride. 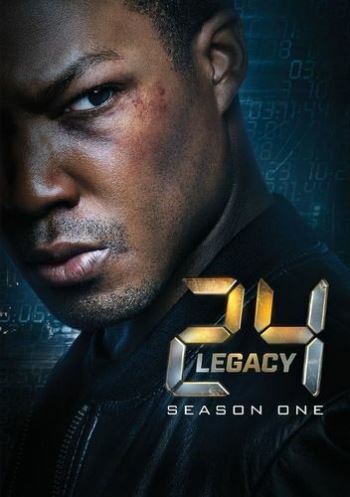 Despite the box calling this 24: Legacy – Season One, the series has already been cancelled, so there will never be a Season Two. Officially the cancellation is due to star Hawkins’ having a scheduling conflict due to his Broadway run in Six Degrees of Separation, but it probably also has a lot to do with the series’ free-falling ratings after a showy post-Super Bowl debut. Supposedly the 24 franchise will continue going in the future, but no set plans are made yet. While 24: Legacy was certainly imperfect, there was a lot to like there, particularly if you are a fan of the original 24’s thrill-a-minute filming style. If you missed this on broadcast – and let’s face it, most of you did – there are still a lot of visceral thrills to be found here. Even if 24: Legacy was lesser 24, it is still better than many of the show’s imitators. Since it may be a few years again before they decide how best to jumpstart this franchise, 24: Legacy can keep the fires burning for a while. Copyright ©2017 PopEntertainment.com. All rights reserved. Posted: December 1, 2017. Tags: 24, 24: Legacy, 24: Live Another Day, broadway, Corey Hawkins, CTU, Designated Survivor, Eric Carter, Gerald McRaney, Jack Bauer, Jimmy Smits, Kiefer Sutherland, Miranda Otto, politics, PopEntertainment.com, Six Degrees of Separation, Super Bowl, TV on DVD, TV on DVD Review, TV on DVD Reviews. Bookmark the permalink.